Is Omega Dubai Desert Classic win start of something special for Li Haotong? Victorious at the Emirates Golf Club: Li Haotong. Li Haotong may not yet be a household name, but he is also not Shaun Micheel or Rich Beem. If you’re not a big golf fan, the two latter names won’t mean much to you. In fact, even to passionate die-hards, they might not mean much more. The unlikely 2003 and 2002 PGA Championship winners sloped back into obscurity after those shock major wins. Although Li’s appearance at the top of the leaderboard in Dubai on Saturday night would have raised a few eyebrows, his gritty determination and self-assured lack of fear in the face of adversity had been there for everyone to see all weekend – not just in the heat of battle on Sunday. History shows us that experience counts for a lot in sport’s pressure cooker situations. Add in Rory McIlroy’s scintillating early 2018 form on his return from three months out. Not to mention a two-shot swing that saw the Northern Irishman take what appeared an ominous lead on 10 on the Majlis course. Admit it, you expected the magician to conjure a third win on what is a special course for him, and thus end a barren 16-month spell without a win. But with the heat on, Li has already shown before this weekend that he thrives in such situations. A closing 63 at last season’s Open Championship and a fourth-round 64 to win the 2016 Volvo China Open – his maiden European Tour title – were proof already that he possesses his own special powers. Keeping the chasing pack at bay on Saturday and going toe-to-toe with McIlroy simply accentuate the fact he seems destined for the top. That he fell two shots behind one of the best players in the world down the back nine yet clawed his way back to victory should send shockwaves around not just the European Tour, but world golf. 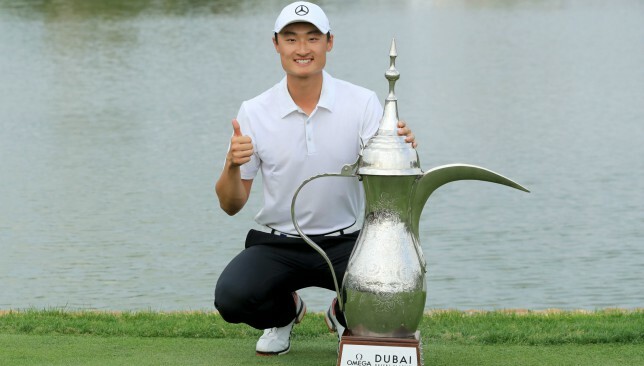 The fact victory at Emirates Golf Club will see him become the first Chinese golfer to enter the world’s top 50 today just adds to the lustre emanating from this burgeoning 22-year-old talent. Unlike those career-defining victories for Micheel or Beem, Li has a much higher ceiling. Even in the wake of his Emirates triumph, he had already started talking of the future. Not just targeting more wins, but striving for bigger performances on the biggest stages; majors, and particularly Augusta – arguably the grandest stage of all. His win at the Omega Dubai Desert Classic could end up becoming just an early chapter in a storied career.